The laparoscopic cholecystectomy has allowed the detection of an increasing number of incidental gallbladder cancers (IGBC). Although laparoscopy is employed in the management of a variety of abdominal tumors, its use in gallbladder cancer is reduced and controversial. 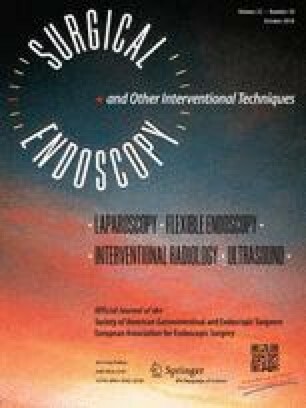 This study analyzes the role of laparoscopy in gallbladder cancer with the focus in IGBC. We evaluated our prospective series of 51 patients with an IGBC who were treated by laparoscopy between 2006 and 2016 at the Clinica Alemana in Santiago, Chile. The series comprised 7 men and 44 women. Age ranged from 43 to 76 years (mean age 60). Regarding wall involvement, 29 patients had a T2 tumor, which was the most common. 8 and 14 patients had T1b and T3 tumors, respectively. Of the patients, 17 underwent only laparoscopic exploration. This was due to the presence tumor dissemination not being observed in the preoperative staging. 10 patients had to be converted to complete the resection, whereas 24 patients were laparoscopically resected. The quality of the resected material was not different between those who were converted and those who were treated by laparoscopy. In the laparoscopic group, the average number of harvested lymph nodes was 7.9, not statistically different from the converted group. The mean of hospital stay in the laparoscopic group (4.3 days) was significantly lower than the converted group. Laparoscopy has been shown to be a safe and feasible method for the management of IGBC. This method not only allows for a complete exploration, identifying a previously unseen residual tumor, but also makes it possible to accomplish the same oncology objectives as the open procedure. Therefore, laparoscopy should be considered a valid alternative in the management of IGBC. Xabier de Aretxabala, Federico Oppliger, Nicolas Solano, Guillermo Rencoret, Marcelo Vivanco, Daniel Carvajal, Juan Hepp, and Ivan Roa have no conflicts of interest or financial ties to disclose.